Hey everyone, here is the first snippet of Valor’s Child, the second book of the Children of Valor series. First, the blurb and the cover image, and the snippet is to be found below. 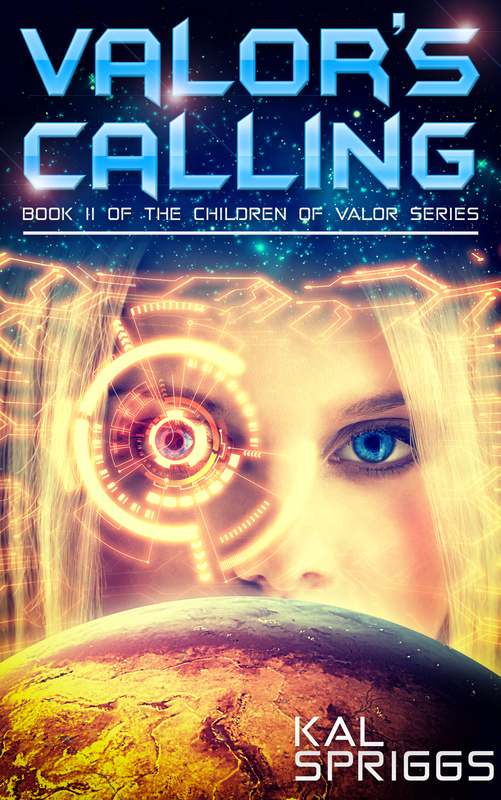 Valor’s Calling comes out on the 29th of September. Enjoy! The past calls you back. Jiden made the decision to join the Century Military Academy after her attempt at a normal school ended in disaster. She’s embraced this new chapter in her life and she’s ready to do her best. Jiden’s best may not be good enough. Her relationships with her friends have changed since she’s been away, her classes are harder than she expected, and things aren’t quite what they seem. Jiden made enemies when she chose to return to the Academy, and those enemies will settle for nothing less than her death. Jiden must fight with everything she has, not just to succeed, but to stay alive. Jiden will prove that she isn’t afraid of the challenge, because the military life isn’t just a simple decision, the military is her calling. While my parents had hardly been excited about me attending the Academy, I had expected a bit more enthusiasm from my best friend. After all, it would mean we’d be there together. “You’re what?” Ashiri Takenata stared at me through my datapad. “I’m coming to the Academy,” I repeated, feeling stupid. I’d meant to tell her and Alexander Karmazin the news as soon as the Admiral had accepted my application. But Mom had sort of freaked out about it and with all the chaos after my misadventures at Champion Enterprises, I hadn’t got around to it until now. “I had a letter of explanation that I put in with my application packet, I’m accepted,” I answered. The Admiral hadn’t pulled any punches, either. Someone might assume that, being my grandmother and all, she would show me some favoritism. Of course, I’d say they were crazy. The Admiral had barely spoken a dozen words to me outside of what could be strictly viewed as professional terms. I hadn’t even met her before my fourteenth birthday… and as far as I knew, my Mom only spoke to her around the holidays, and then only in a formally stilted video call. What can I say, my family is a mess. “Did you tell Alex?” Ashiri asked. “Karmazin?” I replied. I didn’t really think of him as an Alex. I mean, he was far too… imposing for that. Alexander Karmazin was almost two meters tall. With his olive complexion, curly dark hair, and handsome looks, he could have passed for an actor on one of those daytime shows. When I’d first met him, I’d instantly hated him, he’d seemed to be everything I wasn’t: tall, confident, and his father was the richest man on the planet. Now I considered him a friend, maybe something more. He’d certainly hinted that he was interested in something more, the last time we’d talked in person, almost five months ago. She cut the call and I stared at my home screen for a long, puzzled moment. I’d met Ashiri at the Century Military Academy. We’d been in the same squad of Sand Dragon. We’d slept on the ground together, been shot at together, and struggled through some really rough times together. I wasn’t sure why she seemed nervous at being my roommate. It wasn’t like I was anything like her old roommate, Rakewood. I wasn’t going to dump on her or anything, I could pull my own weight. For that matter, I had no idea why she was out of bandwidth. I sort of remembered that her family didn’t have the best financial situation. They’d come here as refugees or something, back when the Guard had annexed their homeworld in the Ten Sisters system. But bandwidth for video calls was plentiful. She’d have to have been spending eight or ten hours a day to put a serious chink in even a basic bandwidth plan with the planetary network. It was different out here at Basalt Mesa Outpost. It was an archeological and research station, with a permanent population of only thirty. The video call had used up a lot of my family’s non-research bandwidth. In fact, I’d probably talked longer than I should have, but I’d wanted to see Ashiri. The past five months had been rough. I hadn’t really had any friends… well, none besides Ted. He’s dead now, I reminded myself. The accounting intern who’d been friendly to me had been kidnapped and probably killed by the smugglers who’d been buying stolen military equipment from rogue elements of Champion Enterprises. Officially he was missing, but I’d talked with Ted’s parents. They planned on holding a quiet funeral after all this blew over. I felt horrible for them. If I were them, I would have blamed me. But they hadn’t. They’d actually thanked me for uncovering the corruption at Champion Enterprises… and for bringing their son’s killers to justice. That left me feeling adrift. I shouldn’t have got Ted involved. I should have handled it all differently, should have gone straight to the Admiral when it all started, but I’d screwed it all up. I’d been kidnapped, nearly killed. Ted was vanished, as if he’d never been. I’d been able to fall back on my military training from the Academy Prep Course, which had saved my life… but I’d killed six men in the process. I wasn’t fifteen Century years old yet and I was a killer. That was one more reason I’d chosen to attend the Academy. Someone should have been there to protect me, to protect Ted. Maybe I could prevent someone else’s family from having to hold a quiet funeral for their child. For just a moment I felt the urge to call Alexander Karmazin. Of anyone, I felt he’d understand. He’d had to fight for his life, too. But some measure of Ashiri’s nervousness made me hesitate. Why had she been so insistent that I call him? It can wait, I told myself. In a couple more days, I’d fly to Duncan City, and I could meet him and Ashiri there. I could talk to them in person and figure out any problems. Besides, I’d already used too much bandwidth and I had a full ethics research paper to knock out. I flipped my datapad back over to the course material and got started. Sutek Press releases Fate of the Tyrant on June 30th! Here’s the first snippet for Fate of the Tyrant! Covle Darkbit had undergone something of a transformation over the past months of bitter cold-weather fighting. His perfectly trimmed beard and mustache had become a ragged, unkempt thing. His finely tailored tunic and hose had been replaced by a practical — and warm — woolen coat and heavy overcoat. His cheeks, normally slightly plump from his love of good food and wine were gaunt, kept from the edge of starvation only through ruthless efforts to keep himself and his men fed. The internal changes, though, would have surprised those who had not known him before he took up Lord Hector’s service. He stared through the sparse trees with a hungry look. Yet he remained motionless, a patience driven home by the hard fighting here in the borderlands between what Lady Katarina and Lord Hector’s armies claimed. Covle would never have waited motionless for hours in the miserable cold and snow, not without the desperate patience earned through dozens of skirmishes in these border lands. He had seen several of Lord Hector’s other mercenary commanders give in to eagerness or impatience… which was why only his force remained of those sent by Hector to savage the rebels. Well, he admitted, that and the fact that I have some help. He stroked the hilt of his sword, warm to the touch, a gift from Xavien at their last meeting. Xavien had told him that it would draw power from those it killed and that it was an old, and valuable, weapon. At the time, he had felt flattered by the gift and took it as a sign that Xavien did not blame him for the mess at Zeilona Gora. Now, it was just a tool to keep him alive. The sun came out from its hiding place in the clouds. He squinted against the sudden glare of sunlight on snow. What a sad, pathetic thing I have become, he thought, a thing of the cold and darkness. Yet he felt a cruel smile part his lips as his patience was finally rewarded. Bundled figures moved against the bright snow. At least fifty of them, wrapped in blankets cut into jackets and laden with packs. They had only three wagons with them, the oxen that pulled them were gaunt, as near to starvation as their owners. Refugees from the lowlands, seeking safety and protection from Lady Katarina. Some part of Covle Darkbit was tempted to allow them past. More mouths would stretch things even tighter in the southern highlands. While in the north the farmers were getting in the last of the season’s crops, frost and snow had fallen early here in the highlands. Covle and his fellow mercenaries had burned stockpiles of food where they could. Yet he knew that the rebels had some supply routes through the Ryft Guard. And in spring, these starving refugees would be more hands to help get crops in… and more volunteers for Katarina’s army. No, he thought, while I would prefer to kill rebels, I’ll leave refugees dead in the road just as gladly. Besides, these poor fools would have their most valuable possession with them and he had already accumulated a tidy stash of loot from the others he had hit. The thin snow of late fall slowed them as they trundled along the road. It tugged at their wagon wheels and dragged at their feet. “At them!” Covle snarled and his men leapt to their feet. His handful of bowmen loosed a volley and threw aside their bows to join the charge. “It’s a trap!” he shouted out as he stumbled to a halt. The laden wagons had looked heavily laden… and they were, save with fighting men instead of furniture or supplies. At least thirty more men rose up from the wagons, many armed with bows. They took aim and loosed as Covle’s men stumbled to a halt in shock. Those arrows scythed into his men from close range and Covle felt his stomach sink as dozens of his men went down. On fair terms, he would have taken any hundred of the enemy with his own company… but now the enemy had the numbers and advantage… and they had already proven the had the element of surprise. “Fall back!” Covle shouted out. They closed ranks as his sergeants shouted commands and began to withdraw, even as the enemy started to advance. Covle felt his mouth go dry as he hoped, for a moment, that the rebels would charge him. If they broke ranks to pursue him, his men could hammer them, for his men had the better armor and weapons for this fight. Covle felt his hopes dashed, though, as a big, one-eyed man moved to the front of the rebel formation and slow their movement. Damn, Covle thought, it would be good to salvage something of this. The enemy volleyed more arrows towards him, but Covle’s men at their shields up, and Covle swept out his sword to dash a couple out of the air that were headed his way. He had become used to such feats, no longer certain if his skill had improved or if the sword somehow sensed such threats and used his arm of its own volition. In truth, Covle didn’t care. He was still alive… and he would live another day. Covle grimaced at that. The rebels had a number of commanders who had garnered fear among Lord Hectors mercenaries. Swordbreaker was one of them, purportedly the same who had killed Grel. Covle didn’t believe that any one man could have killed Grel, the Duke’s Hound. More than likely it would have taken dozens of men and left most of them dead in the process. He saw Savino nod and look a bit more confident at that. Then again, if the rumors were right, half of his company had died when they ran into Swordbreaker’s Ghost Company. Have to put some spine back into the men after this fight, Covle thought. Though he had mentioned a patrol, he would probably have them burn out some more farmers to give them their confidence back.